The proud moment when two Italians met in the final of the US Open will go down in history. Can you tell us how you felt seeing them play? Flavia and Roberta accomplished something extraordinary and advertised Italian excellence to the world. 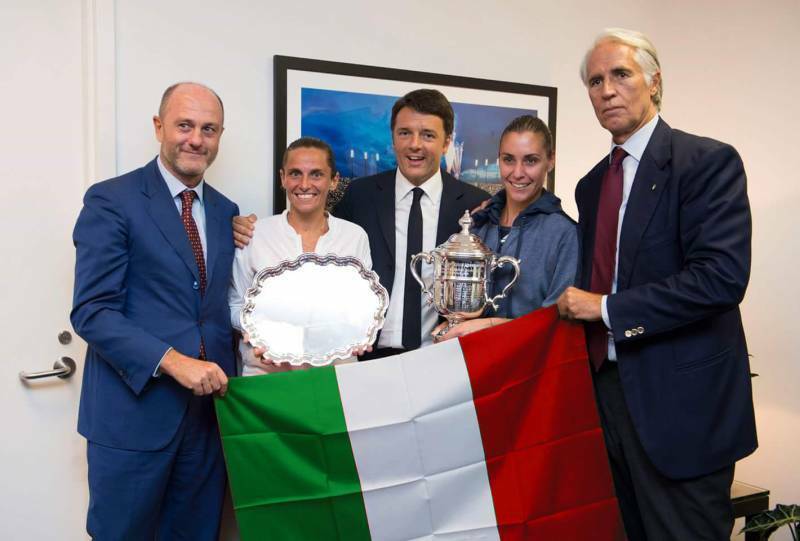 It was a special feeling, which I had the pleasure of sharing with Prime Minister Matteo Renzi and President of the Italian Tennis Federation Angelo Binaghi, proof of the great affinity between the government, the country, those two champions and our operation, which proudly reflects the competitiveness and skill of all our athletes. That day will remain in the hearts of all those who love our country. And it is evidence that sports plays a crucial role in effectively championing our ideals, passions and talents. Success of this kind helps spur young people to be active and constructs a new cultural model for the next generation. Women’s sports were at their height. Despite the fact that Italy still has many problems in this regard. For example, female athletes earn on average 30% of what their male counterparts make. And basketball, cycling, golf and soccer are still considered professional sports for men only. In Italy the matter is governed by the law of professionalism. Under that extremely dated law, very critical decisions have been made. CONI, as far as it is capable, intends to take all the necessary actions to incentivize the growth of female participation in the sports federation. But politics has to do its part too. We have pressing need of a legal framework that regulates the entire sector and is aware of our existing exigencies. The current system is archaic and inadequate. We need to ensure—as much as is possible— that the practice of women’s sports is safeguarded. The whole world has seen the image of two tennis stars who are rivals and friends. How can we underscore this message for a generation that is, unfortunately, more familiar with fighting in the stands? Rome 2024. Rome has bid to host the Olympics in 2024. The Games of 1960 are still remembered as being very successful: Working facilities, extraordinary media coverage for the era, the amazing memory of Bikila’s victory. Now, over 50 years later, what could hosting such an event mean to Italy? Hosting the Games would be a great opportunity to endorse not only the city but the country in high style. The new criteria for being appointed by the International Olympic Committee pay greater attention to the event’s sustainability and reflect how the landscape has changed: no more reckless gigantism but low-cost games with a small carbon footprint. Rome means tradition and charm, it embodies a multicultural dynamic that is the essence of the Olympic message. It also vaunts an incomparable artistic patrimony. The bid is a challenge being tackled with the full support of the government and other institutions, in order to help sports and Italy, in order to give our children and future generations the chance to hold their head up high again. The Olympics would generate almost 170,000 jobs. And, more generally, by connecting our big sports initiatives, we stand to raise GNP from 1.7% to 3% in 5 years.